The 2013 edition of the Alice Lloyd Eagles cross country team will be the largest combined squad in school history. Coach Gary Stepp has eight men and seven women who will don the royal blue and white this year. The women’s squad returns highly regarded sophomore Allison Holbrook (Leslie Co.) who had a solid first season, and finished in the upper half at the KIAC Conference tournament. Brianne Osborne (Wise Christian) should help the squad with her continued improvement as she enters her first season for the Lady Eagles after a redshirt year last year. A talented crop of newcomers has Coach Stepp excited about this squad. Kassie Rouse (Harlan Co.) was one of the top high school senior female runners in eastern Kentucky last season and was a huge recruiting coup for the Lady Eagles. Rouse was the class AA Region 7 champion last season. Her high school teammate Jennifer Graham (Harlan Co.) finished 6th in the regional for the past two seasons and is expected to definitely add to the teams improvement this year. Julia Brewer (North Laurel) was one of the top Class AAA runners in Region 7 two seasons ago. After taking off for one year, Brewer will redshirt this season, but looks to be a major factor next season in helping the Lady Eagles in their quest to battle the conference’s best. In addition, newcomer Katie Hilton (Lawrence Co.) has already shown a lot of determination, and will definitely add to the club’s depth. 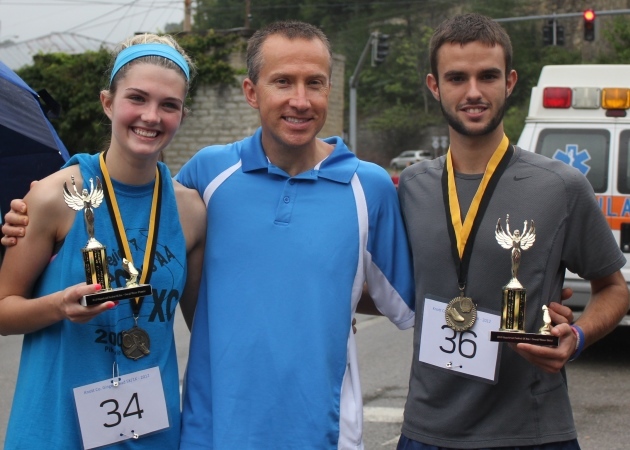 Coach Stepp with Holbrook and Randolph, last season’s top runners. On the men’s side, Stepp has high hopes for the entirely new group he has brought in to join his returning Eagles. Sophomore Greg Randolph (North Laurel) broke the school record last year and hopes to fight toward top 10 placements this season after he bounces back from a back injury. Fellow sophomore Ethan Bowling (Jenkins) showed exciting promise last year before suffering a season-ending knee injury. He hopes to be back to the squad by mid-season. Tyler Turner (Harlan Co.) used last year as a redshirt and looks to add to the club’s depth. David Lee (Harlan Co.) was the boys’ AA Region 7 champion two seasons ago and has the potential to be among the league’s top runners. Lee will redshirt this season, along with Jonathan Aldana (Belfry) and Jimmy Noble (Buckhorn) who was the team’s #2 runner last year. Three first-timers are working hard to help the club inch up in the conference standing as well. Freshman Donavan Johnson (Harlan Co.) helped lead his club to the state tournament for two seasons and has shown a great work ethic. Clay Montgomery (North Laurel) has quickly impressed with his rapid improvement, while freshman Cody Slone (Betsy Layne) has earned everyone’s respect with his gutsy determination. The 2013 season opens on September 6th at the University of Pikeville Dual Meet.